Recorded at the Rock In Rio festival, Rio De Janeiro, Brazil, on 12th and 19th January 1985, starting at around 2:00am. The majority of the tracks were recorded at the first show on 12 January, with the exception of 'Now I'm Here', 'Love Of My Life', the piano intro before 'Bohemian Rhapsody', and 'I Want To Break Free'. It is fairly difficult to identify the origin of each track, but the easiest way is that Roger wore white trousers on the first night, and black on the second, but you don't see him close-up very often. Some tracks feature footage from both shows. This video is also available as a bootleg release titled 'Rock You From Rio', on CD, vinyl and DVD. 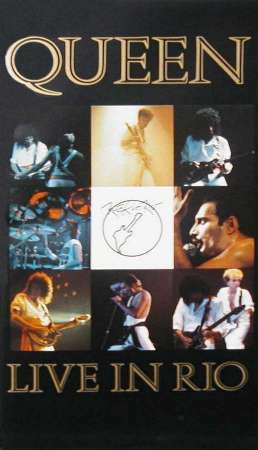 The release comes in a white sleeve, with a picture from Freddie from 1986 on the cover, and is a direct copy of the original, but apparently the DVD video footage has been stretched and is distorted as a result. It was not released by Queen or their record companies, but has somehow found it's way onto Amazon and other retailers. Spike Edney provides additional keyboards and guitars. The video was later released in 2013 on DVD as part of a 6 DVD Box Set, exclusive to North America. It is a straightforward video to DVD conversion, with no remastering or remixing, and retains the same tracks. This is a backing track, played at the beginning of the concert, and only the final drums were performed live. The audio for this track was recorded at the first show, on 12 January 1985, but it features footage from both shows. This track was released as a bonus streaming video as part of the 'Absolute Greatest' release in 2009. The track is identical to normal, but omits Freddie's dialogue at the end. Excerpts of the track also appear on the 'Rare Live' video. Freddie: Hello Brazil, hello Rio. Tudo bom? This track segues into 'Keep Yourself Alive'. This track segues from 'Seven Seas Of Rhye' and into 'Liar'. This track segues from 'Keep Yourself Alive'. This track is followed by a Freddie Singalong, of length 0:18. The track itself was later released as a bonus track on 'The Works' 2011 double-disc reissue, omitting the singalong, with one line of improvised lyrics corrected. Details of the original version can be found on the 'The Works' album page, while details of other singalongs can be found on the Live Solos & Improvisations page. The audio for this track was recorded at the second show, on 19 January 1985, but it features footage from both shows. This track, minus the dialogue, was later released as a bonus track on 'The Works' 2011 double-disc reissue, which has a slightly longer outro extending it to 2:28, and a 29 second acoustic intro by Brian, giving a time of 2:57 in total. This track was recorded at the second show, on 19 January 1985, and was released as a bonus streaming video as part of the 'Absolute Greatest' release in 2009. The track is identical to normal, and includes Brian's dialogue at the end of 'Is This The World We Created? ', from 'You wanna sing with us?' onwards. It was also released on a US cassette single of 'The Five Live EP'. This track includes Brian's guitar solo (length 1:56), before the rest of the band join in for 'Brighton Rock' (length 1:02). As this is such a short guitar solo, clearly the rest has been edited out. Details of the original version can be found on the 'Sheer Heart Attack' album page, while details of other guitar solos can be found on the Live Solos & Improvisations page. This track includes a short piano intro, which comes from the second show, on 19 January 1985. This track was recorded at the second show, on 19 January 1985. It was later released as a bonus video on 'The Works' 2011 iTunes LP. This track has no dialogue or lyrics.